(Nanowerk News) Liquid crystal elastomers (LCEs), essentially rubbers with liquid crystal properties, can do a number of fascinating things, especially in the fields of optics, photonics, telecommunications and medicine. They can curl up, bend, twist, wrinkle and stretch when exposed to light, heat, gases and other stimuli. Because they are so responsive, they are ideal for applications like artificial muscles and blood vessels, actuators, sensors, plastic motors and drug delivery systems. They can even be used as a mechanically tunable mirrorless "rubber" laser. In the College of Arts and Sciences at Kent State University, Peter Palffy-Muhoray, Ph.D., associate director of the Glenn H. Brown Liquid Crystal Institute® and professor of chemical physics, has been collaborating with the world's experts in liquid crystal elastomers research for many years. Recently, he and his graduate assistant, Andrii Varanytsia, and Kenji Urayama and Hama Nagai from the Kyoto Institute of Technology in Japan developed the first type of cholesteric liquid crystal elastomers with special properties that enable it to precisely emit laser light, without the use of mirrors, while being stretched (Nature, "Tunable lasing in cholesteric liquid crystal elastomers with accurate measurements of strain"). Lasers consist of cavities, typically formed by fixed mirrors. Light bouncing between these has a characteristic frequency, just like a guitar string of a certain length. Light-emitting material in the cavity amplifies the light wave, which is then emitted at a precise frequency - like a pure tone from some musical instrument. In 2001, Palffy-Muhoray, Bahman Taheri, Ph.D., and several other colleagues were the first to demonstrate that they could use liquid crystals to bounce laser light back and forth inside the material, without the need for any external mirrors. However, accurate control of the laser emission frequency was not possible then. 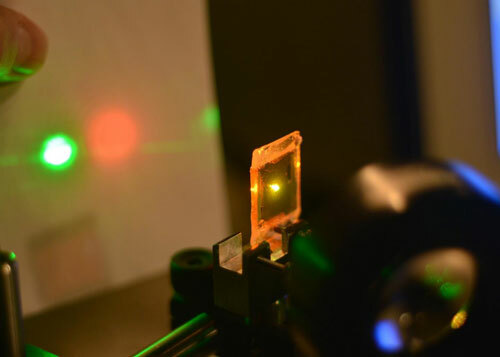 "We can use the information learned as the basis for moving toward applications - such as remote sensors, which can be interrogated from a distance using optic fibers, and as precisely tunable light sources, which are very difficult to produce," Palffy-Muhoray said. The sensor could measure strain, which is just a small change in length, or stress, which is force per area. "In principle, it could be put into a shoe, to measure shear stress on a diabetic foot, and it could be interrogated by an optic fiber; a pulse of light could be sent in the fiber, and the color of the returning light from the laser emission would carry information about the strain," Palffy-Muhoray said. "Similarly, remote equipment could be monitored - by measuring stress, strain, temperature and presence of chemicals - by optic fibers using light." The liquid crystal acts as both the distributed cavity host and the active medium. Simple optical pumping of such a sample results in low-threshold, mirrorless lasing at the band edges. Liquid crystal elastomers can change their shape when the orientational order of the constituents is changed - by changing the temperature, applying a field or introducing impurities. "We are continuing to work in this area to develop new materials which are even better at tunable lasing," Palffy-Muhoray said. "Today, primarily scientists looking for better understanding of light-matter interactions and engineers planning for future devices benefit from the results of our study. However, tomorrow, society at large is likely to benefit. Before 1970, liquid crystal research was mainly driven by scientific curiosity. The discovery of the twisted-nematic effect and the invention of liquid crystal displays at the Liquid Crystal Institute at Kent State University transformed display technology, benefiting people all over the world."